This is the message I preached on Transfiguration Sunday, March 3 at St. Timothy Lutheran Church. The text was Luke 9:28-36. Lancaster, PA is home to a theater extravaganza featuring biblical stories presented in a very dramatic fashion. According to people who have gone to see a performance, it is quite an experience. Today we read of God’s own sound and sight production, featuring heroes of the faith from the Old Testament as well as Jesus and a few of his chosen disciples. And oh…what we see and hear. God’s show of Jesus’ transfiguration is in three acts—the first revolving around what was seen, the second revolving around what was heard and the third act concerns how this effects us. Jesus took Peter, James and John with him up a mountain. Mountains were considered places close to the spiritual realm, a place for sacred encounters. Throughout scripture, God’s self-disclosure happens on mountains. The disciples’ curiosity must certainly have been piqued. Prayer was an integral part of Jesus’ life. It was from this core relationship between Father and Son, nurtured by prayer that Jesus acted. Jesus’ own discipline of prayer instructed his disciples and the church. We see Jesus in prayer here as elsewhere in the gospels. In the first act, with its emphasis on sight, we have the Transfiguration. Jesus glows—his face changes and his clothes are super bright white, like the stars. Jesus’ inner being was transparent to his companions. Then Moses and Elijah, representing the Law and the prophets, come on the scene conferring with Jesus. Luke is the only gospel writer who tells us the topic of their conversation, which was Jesus’ approaching suffering and death in Jerusalem. I can’t help but think that maybe Jesus needed this encouragement to prepare him for what was coming. Moses and Elijah had each suffered rejection and persecution and each was vindicated by God. Their presence confirms Jesus prediction of his own suffering and death, but also his future vindication in resurrection and ascension. On the mountain, Elijah and Moses bear witness to Jesus as the One who fulfills and surpasses their roles. Jesus is the One to whom the law and the prophets point. Looking on were sleepy Peter, James and John--so sleepy that they nearly missed all the excitement. But, “since they had stayed awake,” they witnessed Jesus’ glory and his time with Moses and Elijah. In Act 2, Peter wants to build and is interrupted by God. The emphasis is on listening. Peter wants to commemorate this moment in time, building places to honor each of the three before him. After all, these were two of the greatest heroes of the Jewish faith right there, speaking with his master. But there’s more. In fact, if this was happening today, the disciples would probably record the whole thing on a smartphone. Elijah and Moses depart. Jesus, Peter, James and John were enveloped by a cloud. All the voices have stopped. But then, God interrupts Peter and his building plans. In a non-verbal way, God basically tells Peter to “Shut up and listen.” Sometimes the more Peter talked, the more he got into trouble. At times, the more we talk and the more we do, the less able we are to listen. But then, there’s a voice. 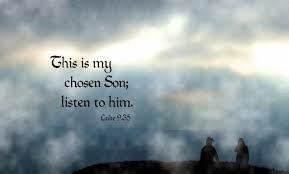 It is the voice of God the Father alone, making clear who Jesus is and who the disciples need to listen to. In the cloud, divine disclosure takes the form of the spoken word. Haven’t we heard this somewhere else? At Jesus’ baptism, he heard similar words, but they were directed at him alone, for his benefit. But now the Father’s words are for the benefit of Jesus’ disciples: telling them who Jesus is and how to follow him. The key to this gospel passage is the phrase “listen to him.” The verb “listen” is in a tense that implies continuing action: “Keep on listening to him” or “Continue to listen to him.” Hearing requires more than sounds entering our ears. Hearing Jesus’ words and acting on them is the important thing. “Listen to him.” The disciples were to listen to everything Jesus said. But the teaching just prior to the transfiguration is specifically what needs to be heard—Peter’s confession of who Jesus was (vv. 18-20), Jesus’ prediction of his passion (vv. 21-22) and the demands of discipleship (vv. 23-27). When all is said and done, after the Father has spoken, “Jesus was found alone.” It was no longer about all three—they must listen to Jesus. God’s Son is the lens through which we must understand Moses and Elijah, through which we read and know the Law and the Prophets of God’s word. He was the One the disciples were to focus on, listen to and follow. Only Jesus. The disciples’ senses had to be overwhelmed. The mountain, the light, the cloud and the voice—all symbolize God’s presence, just as Moses experienced on Mt. Sinai. Fortunately, the disciples did not have to die and join Moses and Elijah in some spiritual realm in order to witness God’s glory. They had it right before them in the flesh. All God’s glory is incarnate in their Teacher, Jesus. In fact, it left them speechless, not telling anyone of what they had seen. Act 3 tells us how Jesus’ transfiguration impacts us. God’s love and the revelation of Jesus shine so brightly, we can barely view this spectacle. However, we do experience that love in baptism, in communion, in service to God and in relationship with God’s creation and our neighbors in need. It is the basis of everything in the life of faith: relationship with God, relationship with each other and relationship with our community. Peter and his companions nearly missed out on the spectacle of the transfiguration because of their sleepiness. Sometimes there are things we allow to stand in the way of our experience of God’s love. We overbook our calendars. Our jobs demand more time. Our social engagements keep us spread too thin. Most of us too, struggle with being weighed down with sleep. Peter, James and John were merely awake and that was enough. Perhaps this is an invitation for us to watch what God is doing where we are instead of rushing to what we think is next. Like the disciples, we too are transformed by spending time in the presence of the Lord Jesus. To get to know him better, we need time in scripture and prayer. We need to make room in our hearts for him. In the midst of our cluttered lives, we need to declutter our minds and hearts so the Spirit can make us more like Jesus. As we listen and awaken to God’s presence, let’s not keep it to ourselves—locking it away in booths or dwellings. Let us be wide awake and dazzled, opening our hearts to God’s presence. God is with us—a source of courage, power and might that motivates us to go out into the world and point others to God’s brilliant sound and sight. Encountering Jesus makes us more and more like him, giving us his passion, moving us to engage in his mission of good news. We cannot keep it to ourselves. We need the fire of God in our bellies to share God’s love with everyone in our world. The world needs what we have—whether they are people who are homeless, addicted to drugs or very well-off, wanting for no material possession. Lent begins this Wednesday with Ash Wednesday, with its disciplines of self-examination and repentance, prayer and fasting, sacrificial giving and works of love. This gives us abundant means of hearing what God is saying to us individually and as a community of faith. These emphases are not just “spiritual,” but very practical as well, as they lead us to works of justice. What are the barriers in our community of faith right here at St. Timothy--the things that leave people feeling outside of God’s presence? How does Christ’s constant example of breaking down and removing barriers challenge us to tear down those walls? (Sundaysandseasons.com). What about our personal barriers that preoccupy us with our own individual needs? Our own faith may falter as we struggle with family troubles or financial issues, various forms of loss and suffering. We wonder if trouble will ever end and may question God’s goodness and lose hope. Like the disciples, we need times of retreat to gain perspective, to meet with God, to allow the Holy Spirit to show us God’s presence in the midst of all we’re going through. Let the season of Lent be a time to carve out time for personal and communal worship, refreshing us so that we are renewed in purpose and mission. Let’s take a few minutes to put our heads together, thinking about what we can celebrate about our life together. How has our community of faith at St. Timothy transformed our local community? And on the flip side, in what measurable ways will we transform our church and community in the future? Discipleship is a process of listening and hearing what God is saying. It is a matter of being faithful to being with Jesus over the long haul. In Christ’s presence, we are formed and reformed to carry on his ministry and mission (Griffith). God is speaking. Are we listening?